Day 1 Delhi/Agra: Early morning transfer to the railway station to board the Shatabdi Express train to Agra (approx 2 hours). On arrival you will be transferred to the Mansingh Palace to drop off your luggage before a tour of Agra. While best known for the Taj Mahal, Agra boasts many other beautiful monuments, tombs and mausoleums, as well as a lovely river setting. Late in the afternoon, proceed to the mesmeric Taj Mahal for a sunset visit. Built entirely of pure white marble, with richly decorated walls and surrounded by beautiful gardens it truly is one of the Seven Wonders of the World. Day 2 Agra: This morning visit 16th century Agra Fort, a UNESCO World Heritage Site, which contains splendid palaces, mosques and reception rooms. 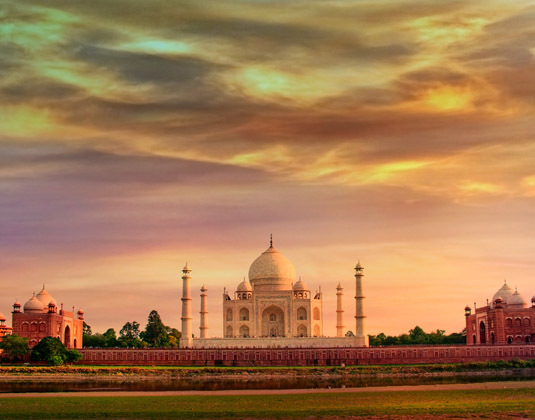 Continue across the Yamuna River for a “Heritage Walk” which showcases lesser known sights before ending at Mehtab Bagh, a fantastic place to view the Taj Mahal. Day 3 Agra/Delhi: Sunrise visit to Taj Mahal before a morning at leisure. Afternoon departure by road to Delhi (approx 3½ hours drive). Centrally situated in the heart of Agra, this 100 room hotel is just two miles from the Taj Mahal and within easy reach of Agra Fort along with shops and selection of dining options. Rooms are individually furnished in a simple style and provide a comfortable place to relax after sightseeing, as does the small garden or swimming pool. The hotel also features a multi-cuisine restaurant and coffee shop should you prefer to eat within the hotel and a bar where you can unwind with a drink. Accommodation: In deluxe rooms at Mansingh Palace which feature air-conditioning, bath, mini bar and safe. Taj view rooms also available. Tour price: The price shown is based on the best value travel dates in low season and includes train travel from Delhi to Agra, private transfers between the station and hotel, accommodation as shown above, sightseeing as stated and private road transfer back to Delhi.